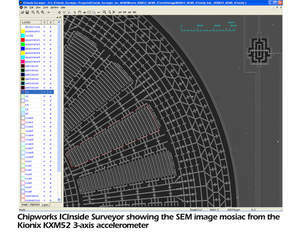 OTTAWA--(Marketwire - July 10, 2008) - Chipworks (www.chipworks.com), the leader in reverse engineering and technical analysis of semiconductors and microelectronic systems, today announced ICInsider Surveyor™, a powerful tool that delivers thousands of extremely high magnification design images directly from Chipworks' labs to design engineers' desktops. 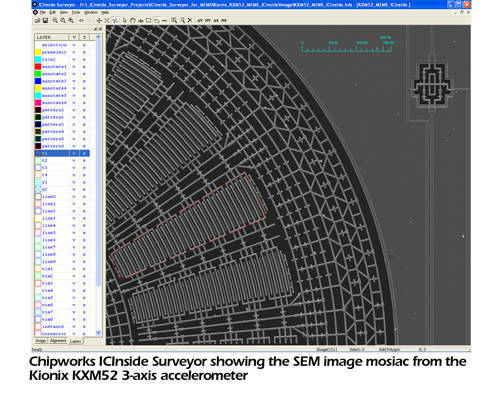 Chipworks will be demonstrating the ICInside Surveyor™ during select appointments at Semicon West in San Francisco, July 15 - 17. "This new capability puts a virtual scanning electron microscope (SEM) on our clients' desktops, giving them the ability to measure, label, and study the layers of a fully imaged device at extremely high magnification," says Julia Elvidge, President of Chipworks. "Our clients benefit by being able to examine every single nanometer across all interconnect layers of the hottest new device, or the structural details of an innovative new MEMS chip." Developed in tandem with our clients, the ICInside Surveyor™ significantly reduces the time required to analyze competitive devices and integrate that analysis into product designs, resulting in lower development costs, faster time-to-market and more socket wins. The ICInside Surveyor™ dramatically speeds delivery of world class reverse engineering analysis that is timely and accurate, allowing design engineers to rapidly understand and realize value from reverse engineering in forward design. The innovative application is a robust way to explore competitive designs and identify areas for die shrinkage, circuit extraction, and layout organization (e.g. ESD structures). For MEMS Architects, it also provides "Infinite Measurability" for building accurate simulations. Additional reports will be available on an ongoing basis, and clients can request a custom analysis at any time. To learn more about the Chipworks ICInside Surveyor™, visit www.chipworks.com/icinsidesurveyor.aspx. To book a demonstration at Semicon West, please contact Rob Williamson at rwilliamson@chipworks.com. Chipworks is the recognized leader in reverse engineering and patent infringement analysis of semiconductors and electronic systems. The company's ability to analyze the circuitry and physical composition of these systems makes them a key partner in the success of the world's largest semiconductor and microelectronics companies. These companies depend on Chipworks to secure, defend, and grow market share, and to save millions of dollars in royalty payments and product design costs, allowing them to earn millions by licensing patents, design superior products, and launch new products faster. Intellectual property groups and their legal counsel trust Chipworks for success in patent licensing and litigation. Research & Development and Product Management rely on Chipworks for success in new product design and launch. 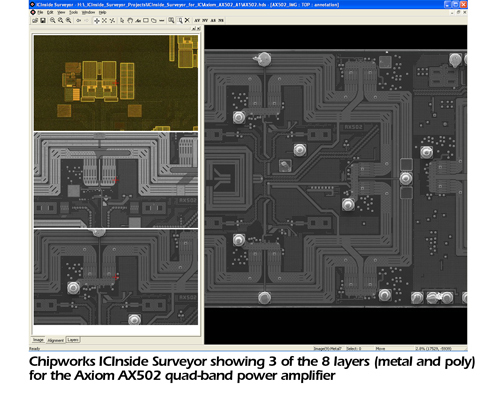 Headquartered in Ottawa, Canada, Chipworks maintains offices in Japan, Korea, Taiwan, Israel, and Poland.